There has been a lot of charges flying in Portland, Oregon following concerns by state regulators over alarming concentrations of dangerous substances – carcinogenic metals cadmium and arsenic- in the air around the Southeast Portland Bullseye Glass (BE) manufacturing facility and whether Bullseye Glass understands the public interest and if they support stronger environmental standards for the industry. BE has posted a letter outlining how the Oregon Department of Environmental Quality (DEQ) is proposing a set of sweeping “temporary” regulations that will severely curtail BE’s glass production, which BE feels is without clear supporting scientific evidence or an understanding of how they make colored glass. The primary issue is the use of trivalent chromium—also referred to as Cr(III). Both DEQ and EPA have acknowledged there is no clear evidence of acute or chronic health risks based on BE’s use of Cr(III). The limitations proposed are based on politics and anchored in speculation that Cr(III) might possibly change into a more toxic form of chromium—Cr(VI) in our furnaces. Scientific evidence clearly indicates the furnaces won’t turn Cr(III) into Cr(VI). If they did, the BE glass would be ruined. 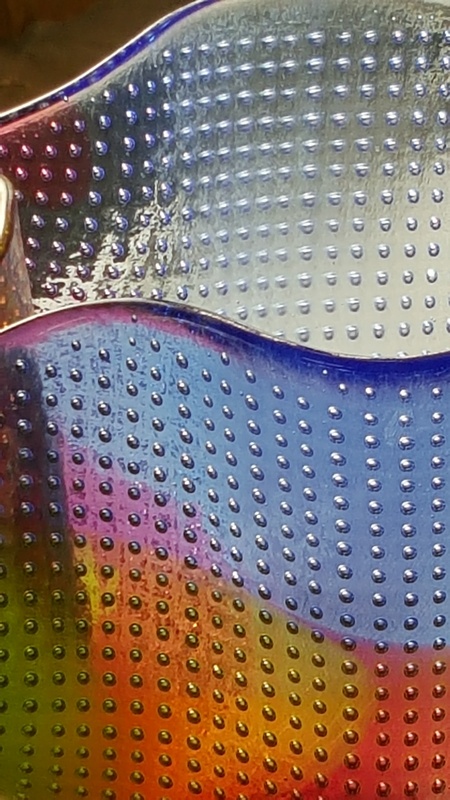 According to BE, Cr(III) is essential to BE producing colored glass. According to BE: “Scientific evidence shows our use of the compound is not harmful. Nevertheless, DEQ wants to restrict Bullseye from using Cr(III) for an extended period of time. They are essentially basing these rules on an assumption of guilt without any proper supporting scientific or factual evidence. These newly proposed regulations are based on politics and fear, not science and fact. They come right after DEQ’s executive director was forced to resign and the supervisor of the air quality department left the agency. If we are not allowed to use Cr (III), we can no longer make green glass. On top of our voluntary suspension of cadmium glass production until our baghouse is in place, this new limitation would eliminate 50% of our product line. It would result in employee layoffs, huge economic impacts to Bullseye and our worldwide customers, and could even drive us out of business. 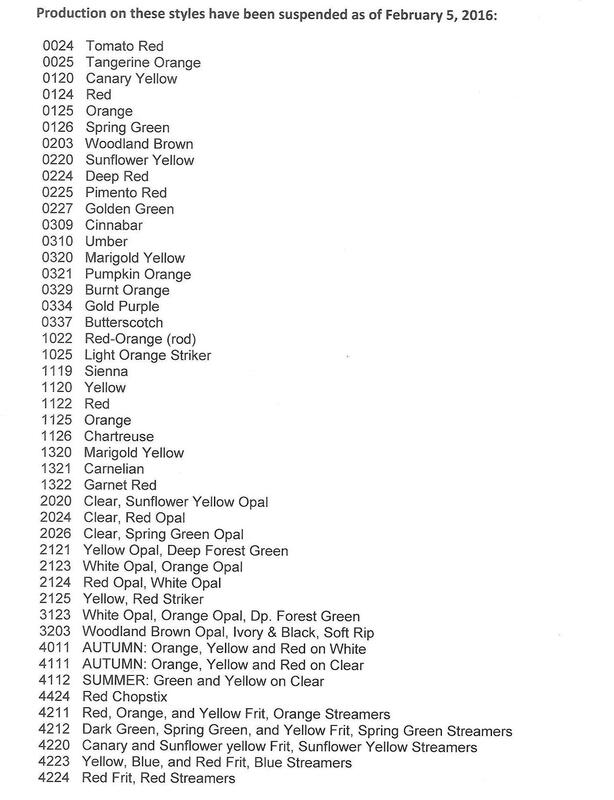 Until March 30, the Oregon Department of Environmental Quality wants to know your opinion on whether or not to adopt temporary rules that are targeted to affect only one specific industry – the colored art glass industry.They could set a precedent that could affect every other colored glass manufacturer in the United States. Click HERE to jump to Bullseye Glass’ message. Washington Project for the Arts (WPA) serves as a catalyst for the creation, critique, and collection of contemporary art. 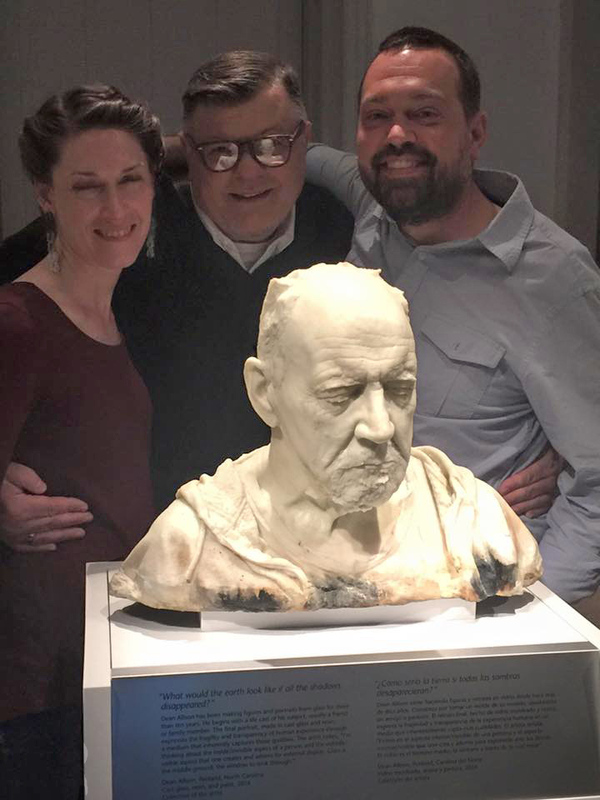 With more than 800 artist members, the WPA is the only DC-area organization to support visual artists at all stages of their careers. Initiated in 2006, the Washington Project for the Arts Alice Denney Award for Support of Contemporary Art is named for Alice Denney, the founder of the Washington Project for the Arts, and is presented annually to honor an individual who has supported the organization for a period of many years and has made a sustained commitment to the greater DC art’s community. 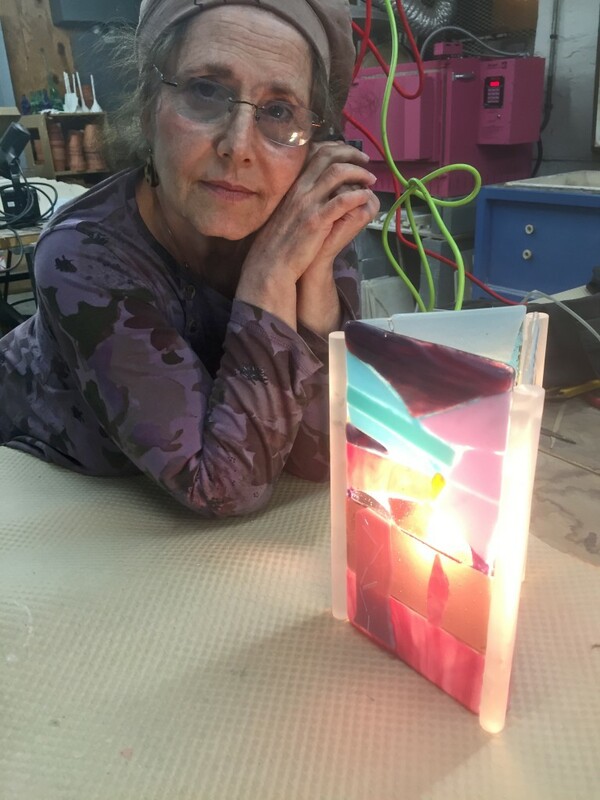 WPA has announced that Fred Ognibene will be the 2016 recipient of the Alice Denney Award for Support of Contemporary Art, and the award has been made by the Washington Glass School. 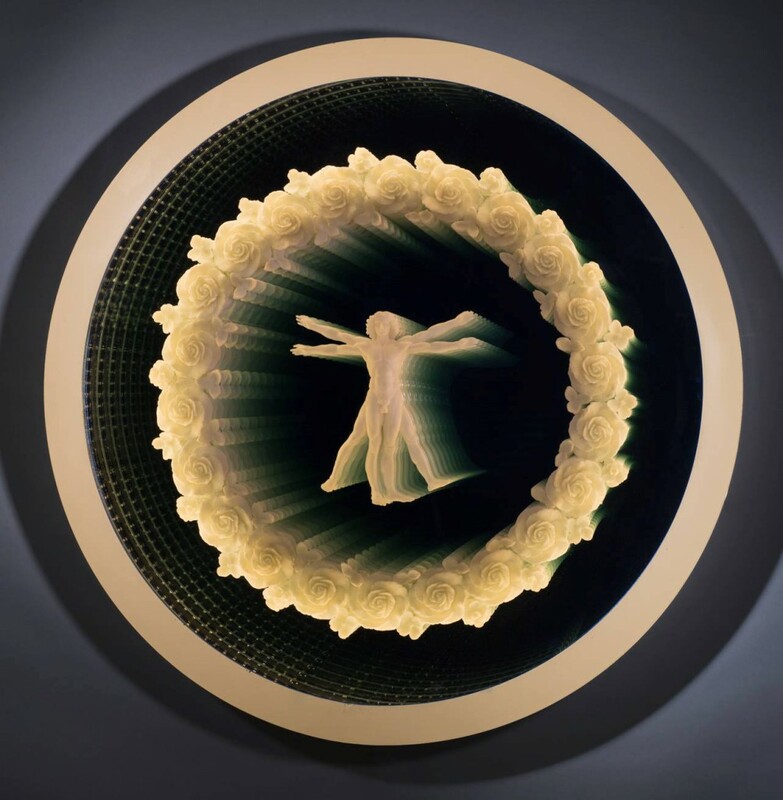 WPA AUCTION WEEK will kick off with an opening reception on Thursday, March 31, from 7 – 9 pm. Click HERE to jump to WPA Gala online page. No Dim Bulbs in Lighting Class! Erwin Timmers instructs one of the lighting class students. Erwin Timmer’s artistic lighting class these past few weeks brought some serious color to the studio – really brightening up the studio! Over the three week class, students completed a number of lighting designs, ranging from pendant to wall sconces and table lamps. Great to see how each created functional art that reflected the tastes and aesthetics of each of the artists. This was certainly a class that put forth the effort in the design! Vibha’s glass design was dazzling! 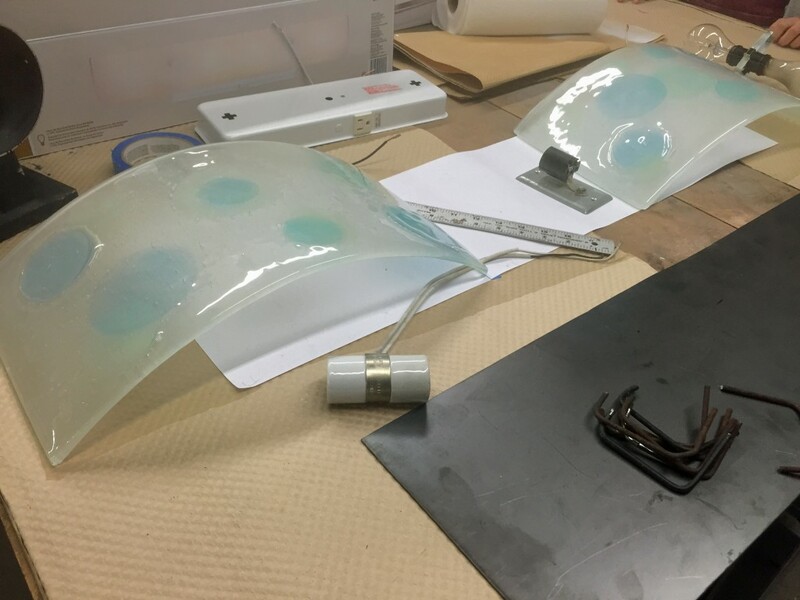 Students designed and made the glass as well as assembled the mounting hardware. 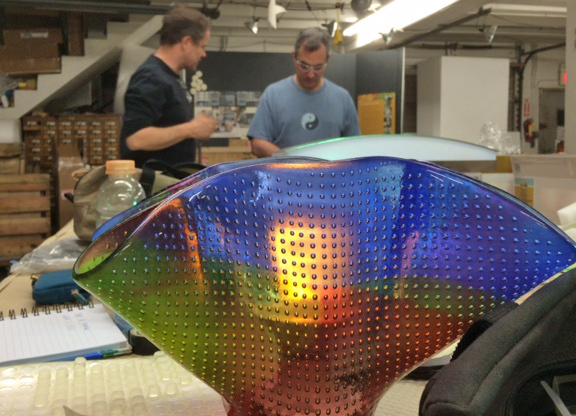 Louis Comfort Tiffany would have been jealous of the glass created for the light fixture. Jerrelee loves her light fixture that relates to her artwork. Michigan’s Habatat Galleries will be exhibiting the work of Laura Donefer, Tim Tate, Udo Zembok, Alex Bernstein, Dan Dailey, Michael Glancy, Bretislav Novak Jr., Clifford Rainey, Ethan Stern, Peter Bremers, Michael Behrens, Christina Bothwell, Marlene Rose and Vivian Wang at Florida’s Art Boca Raton contemporary art fair. Tim Tate will also be featured at the Benzaiten Center for the Creative Arts in nearby Lake Worth, FL. The Benzaiten Center’s mission is to support the creation of significant new works of art, collaboration between peers across multiple media and instruction from master to emerging artists. 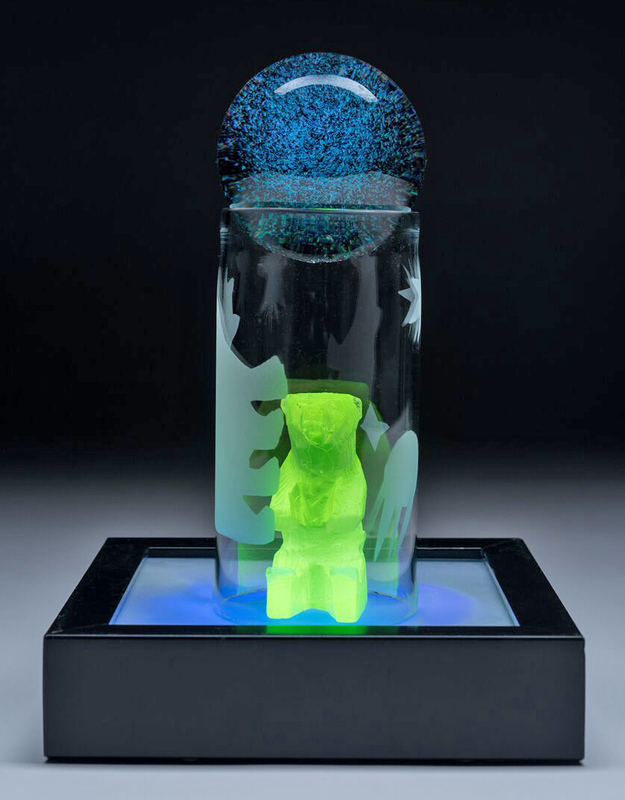 On Friday, March 18th, 6- 8pm Tim will be at the Gallery Opening featuring his work and a discussion about 21st Century Narrative glass artwork. 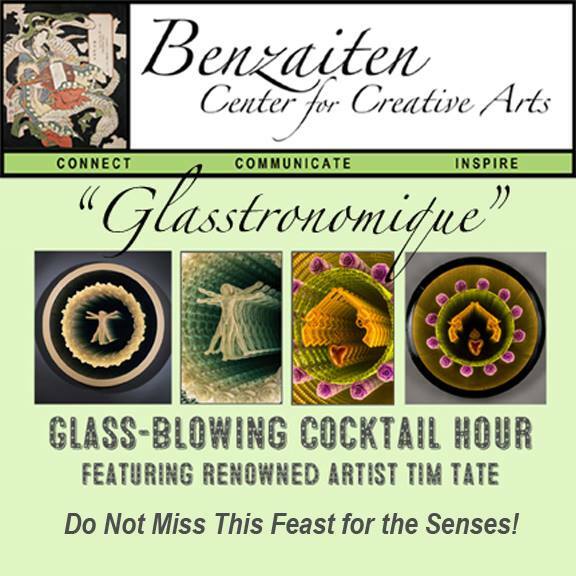 On Saturday, March 19th, Tim Tate – as the featured artist along with Benzaiten’s Creative Director Rick Eggert and the Center’s glass crew – will be performing a glass blowing demo as he creates new work for SOFA Chicago at the Glasstronomique fundraiser. 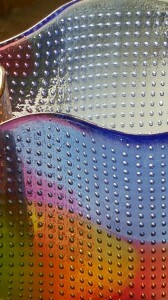 The National Capitol Art Glass Guild (NCAGG) has a juried member show opening in Rockville, MD. The show, titled “See The Light” will be at the Gibbs Street Gallery at VisArts in Rockville, MD from April 1 to May 1, 2016. 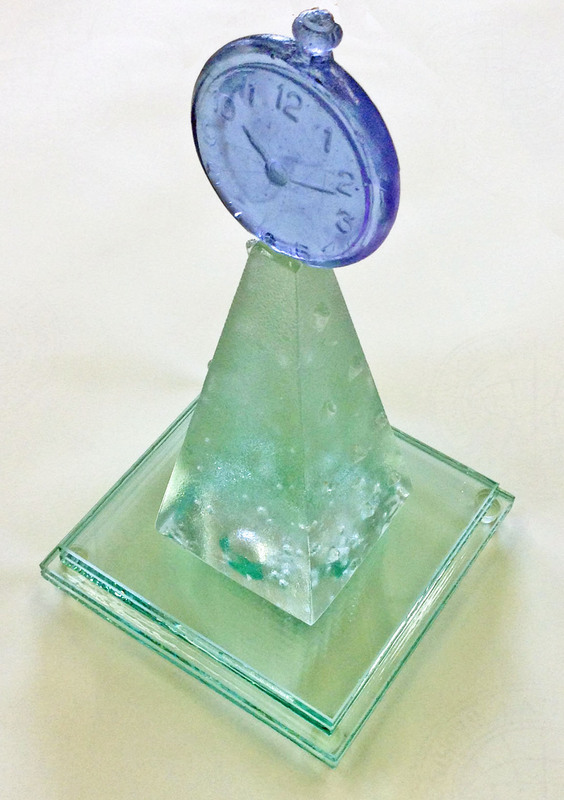 Dean’s cast glass sculpture was one of the 43 finalists selected from the competition’s more than 2,500 entries received. Every three years, the Smithsonian National Portrait Gallery hosts the Outwin Boochever Portrait Competition. The Smithsonian’s National Portrait Gallery focuses on the important role that contemporary portraiture could play in the life of the gallery, as well as in heralding the museum’s engagement with figurative art and portraiture in today’s world. 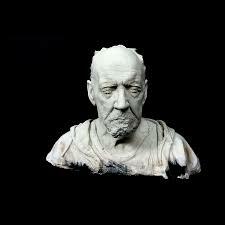 The exhibit “The Outwin 2016: American Portraiture Today” will run March 12, 2016 – January 8, 2017. JRA SPRING CRAFT WEEKEND 2016! 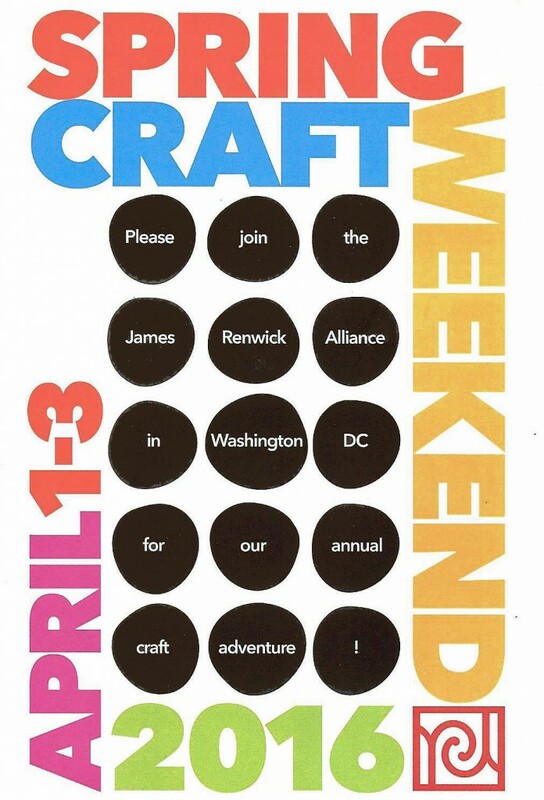 Join the James Renwick Alliance (JRA) for Spring Craft Weekend 2016 on April 1-3 for a joyful celebration of American Craft. 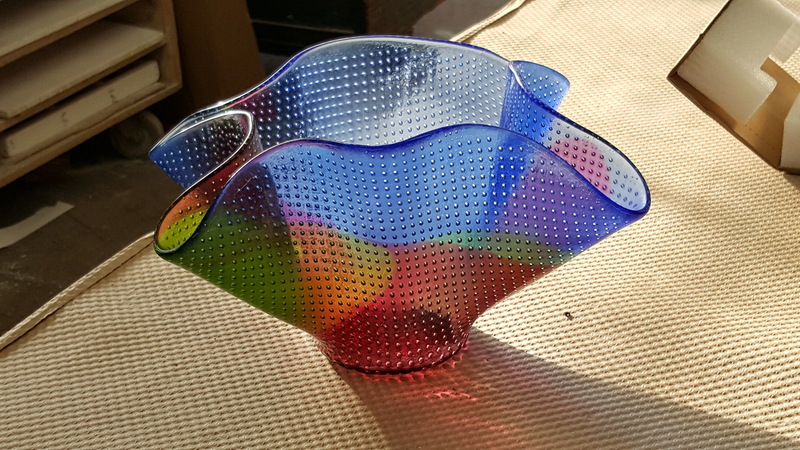 Spring Craft Weekend is a fabulous three day celebration of works made in ceramics, fiber, glass, metal and wood…where Craft as Art is explored in many forms. The JRA honors individuals or organizations in the craft world who have made significant and pioneering contributions in craft education. This year’s Spring Craft Weekend includes a free symposium on Saturday, April 2 at the recently renovated Smithsonian Renwick Gallery – 10:30 am – 12:00pm. Saturday Symposium panel: Stuart Kestenbaum, Chair, Board of Trustees of the American Craft Council and former Director of Haystack Mountain School of Crafts, will chair a panel discussion with four renowned artists: Theresa Secord, founder of the Maine Indian Basketmakers Alliance; Sonya Clark, fiber artist and Chair of the Craft and Material Studies Program at VCU; David Keefe, creator of Combat Paper NJ in New Jersey; and Alleghany Meadows, studio potter and founder of Artstream Nomadic Gallery. 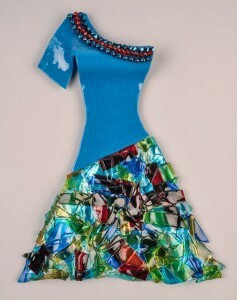 For more info on Spring Craft Weekend & to register for the events – click HERE. American Art Museum’s Renwick Gallery in Washington, D.C.
and education and scholarship programs. Bullseye Glass has been at the center of controversy about Portland, OR air pollution ever since early February, when Oregon regulators asked the company to stop using the carcinogenic metals cadmium and arsenic. The request was prompted by tests showing high concentrations of the pollutant in nearby air.